A new study authored by Anthony Meza, Emily Altman, Suzanna Martinez and Cindy Leung contributes to our understanding of how food insecurity affects students' health and well-being. Titled “It’s a Feeling That One Is Not Worth Food”: A Qualitative Study Exploring the Psychosocial Experience and Academic Consequences of Food Insecurity Among College Students, the study, published in the Journal of the Academy of Nutrition and Dietetics, consisted of in-depth qualitative interviews with 25 undergraduate students from a large public university in California who were recruited from a campus food pantry. Students discussed several themes related to the psychosocial effects of food insecurity: the stress of food insecurity interfering with daily life, a fear of disappointing family, resentment of students in more stable food and financial situations, an inability to develop meaningful social relationships, sadness from reflecting on food insecurity, feeling hopeless or undeserving of help, and frustration directed at the academic institution for not providing enough support. Students also discussed how food insecurity affected their academic performance through physical manifestations of hunger and the mental trade-off between focusing on food and focusing on academics. These findings build on a previous study and can help inform how universities support students’ basic needs. Joanne Ikeda was a Cooperative Extension nutritionist in the Department of Nutrition and Toxicology at UC Berkeley for nearly 35 years. She was highly respected for her research on the food habits of minority populations living in California. She provided guidance in nutrition education and counseling. In addition, Joanne was an early champion of a relatively new approach to weight management entitled Health at Every Size (HAES). This approach in the clinical treatment of obesity was seen as an important paradigm shift in the field of obesity. In the HAES movement and in other ways, Joanne distinguished herself as a visionary thinker. She developed new solutions and approaches to problems. She knew how to bring her ideas to fruition. She, along with Sharon Fleming and Pat Crawford co-founded the Center for Weight and Health at UC Berkeley. This was the first Extension center of its kind in the nation. The Center facilitated interactions among researchers, policy makers and community-based providers from various disciplines and institutions concerned about weight, health and food security. The Center became known nationally for the development and distribution of culturally sensitive nutrition education materials, for innovative studies on childhood overweight and policy work to improve nutrition and reduce disparities. While the Center for Weight and Health is no longer in operation at UC Berkeley, the Center’s projects and Joanne’s mentees were foundational in the creation of a new UC ANR institute, the Nutrition Policy Institute. Joanne’s many colleagues and friends at the Nutrition Policy Institute will miss the wisdom, energy, passion and vision she had for using nutrition as a vehicle to improve people’s lives. Instead of flowers, Joanne requested donations in her name be made to the Society for Nutrition Education and Behavior Foundation at https://www.sneb.org/sneb-foundation/ or 9100 Purdue Road, Suite 200, Indianapolis, IN 46268. UC ANR Statewide Programs are organized to focus research and extension on solving priority problems in the management of California agriculture, natural resources and human development. Meet the UC ANR program directors for the Master Gardener Program (Missy Gable), 4H Youth Development Program (Shannon Horrillo), and Master Food Preserver and Nutrition, Family & Consumer Sciences programs (Katie Panarella), and learn how UC ANR is working to integrate programs to support food literacy, healthy eating and improved food security for Californians. Hear the presentation and view the slides. Lorrene Ritchie will participate in the Kellogg Fellows Leadership Alliance's Global Summit on Food Security and Thriving Communities, an international, interdisciplinary gathering of more than 200 Kellogg Foundation Leadership Fellows, community leaders, changemakers, funders, and experts who will examine food as the gateway to address the complex, cross-sector challenges that communities face today. Lorrene Ritchie has been invited to speak at the University of Missouri as part of the Department of Nutrition and Exercise Physiology's fall 2018 seminar series. She will speak on Childcare Nutrition in California: Conducting Research to Inform Policy. The Nutrition Policy Institute (NPI) will present its research on a range of topics at the APHA 2018 Annual Meeting, the largest annual gathering of public health professionals, held in San Diego this year. NPI's presentations include on November 11: Trends in Nutritional Quality among SNAP-Eligible Mothers and their Children in California (researchers: John Pugliese, Lauren Whetstone, Wendi Gosliner, Gail Woodward-Lopez, and Sridharshi Hewawitharana); on November 13: What SNAP-Ed PSE strategies do communities use to improve health equity for low-income Californians? (researchers: Janice Kao, Gail Woodward-Lopez, Christina Becker, and Lauren Whetstone); and on November 14: both Mother-Child Differences in Nutritional Quality among Low-Income Latinos (researchers: John Pugliese, Lauren Whetstone, Wendi Gosliner, Gail Woodward-Lopez, and Sridharshi Hewawitharana) and Raising Public Awareness about Food Waste: The Development, Implementation, and Evaluation of California's Inaugural Food Waste Prevention Week (researchers: Tracy Delaney, Stephanie Caldwell, Joyce Lee, and Wendi Gosliner). The November 2018 issue of the Nutrition Policy Institute (NPI) Research to Action news brief examines child nutrition in the preschool years, which influences the development of food preferences, dietary patterns, and health outcomes later in life. Read about NPI’s leading research on child nutrition and find out how you can help support and improve nutrition standards for child care centers and homes. This special NPI Brown Bag will feature talks by three NPI summer interns who are Master of Public Health candidates at the UC Berkeley School of Public Health. Joyce M. Lee will talk about “Recruitment & Data Collection: Lessons Learned from the Market Match Evaluation,” Katie Bern will present her summer projects at the National Drinking Water Alliance and Melanie Colvin will discuss her work on the Healthy Beverages in Child Care project. Suzanna Martinez, longtime assistant researcher at the Nutrition Policy Institute, begins a new position on November 1, 2018 as assistant professor in the Department of Epidemiology and Bioststatistics at the University of California, San Francisco. Her research interests include investigating biological, behavioral, social and environmental contexts of health behavior among vulnerable child populations. Martinez, along with NPI Director Lorrene Ritchie and UC Santa Barbara’s Katie Maynard, authored the groundbreaking 2016 UC Student Food Access and Security Study that led UC to develop an action plan to address student food insecurity. Martinez has also been a presenter at several #RealCollege convenings. She will continue as an affiliated researcher at NPI, where she will collaborate with NPI Director Ritchie on a qualitative and quantitative study to understand housing insecurity and homelessness at four UC campuses: UC Santa Cruz, UC San Francisco, UC Berkeley, and UC Merced. In a national study of more than 2,000 low-income children, NPI researchers assessed diet quality in 7-to-24-month-old children. The study, just published in The Journal of Nutrition, found that children are doing well on some dietary components, such as eating iron-rich cereals, but there is room for improvement in consuming more fruits and vegetables, reducing intake of sugary drinks and breastfeeding through 12 months of age. Findings from the study may be used to inform the next Dietary Guidelines for Americans, which currently do not include this important age group. As part of the Academy of Nutrition and Dietetics 2018 Food and Nutrition Conference and Expo (FNCE), Lorrene Ritchie speaks as part of a discussion on New Perspectives on WIC: An Evidence-Based Examination of Early Childhood Dietary Behaviors. Ritchie is an author of the WIC Infant and Toddler Feeding Practices Study-2, and in early 2018, results from the study’s first two years were published.The discussion will cover: 1) how the WIC Infant and Toddler Feeding Practices Study-2 expands prospective research on early childhood feeding practices; 2) a comparison of the dietary intakes of children in WIC to the current standards for pediatric nutrition; and 3) a discussion of how the food, activity and weight trends of low-income children on WIC impact nutrition education and counseling. Claire Cullen, previously an economist at the Australian Agency for International Development, is a PhD student at the University of Oxford’s Blavatnik School of Government, a visiting student researcher at UC Berkeley’s Department of Economics and a consultant at the World Bank Gender Innovation Lab. She will discuss how survey methods affect measurement. In a recent paper, she analyzed the magnitude and characteristics of misreporting on intimate partner and sexual violence using self-reported survey data from Rwanda and Nigeria. She compared women's reports of experiencing emotional, physical or sexual violence using three different survey methods: an indirect method (list experiment) and two direct survey methods (face-to-face questions asked by an enumerator, or audio-assisted self-administered survey on an electronic tablet). She found that women's reports of intimate partner and sexual violence in Rwanda are double when measured using the indirect list method compared to the two direct methods currently used in most surveys. Demonstrating her commitment to physical activity and health, Nutrition Policy Institute Assistant Researcher Lauren Au completed her inspiring 28.1 mile English Channel swim in 11:01 hours this past summer. Au will share her exciting journey, including what foods she ate to keep nourished during the swim, her first meal post-swim, the marine life she encountered, lessons learned and what she has planned next. The presentation will include photos, videos and Q&A. During the #RealCollege 2018 convening, Nutrition Policy Institute (NPI) Assistant Researcher Suzanna Martinez will partner with Aydin Nazmi, associate professor at California Polytechnic University, to give a presentation titled “Measuring food insecurity on your campus.” With increasing focus on college food insecurity, accurate assessment of food insecurity prevalence is crucial. Martinez and Nazmi’s session will highlight key concepts in college food security research, critically evaluate study design and assessment methods, and describe best-practice methods for conducting research related to food security in college environments. Martinez, along with NPI’s Lorrene Ritchie and UC Santa Barbara’s Katie Maynard, authored the groundbreaking 2016 UC Student Food Access and Security Study that led UC to develop an action plan to address student food insecurity. National data have been limited regarding delivery of WIC nutrition education and the impact of WIC nutrition education on WIC participants’ nutrition and other behaviors. To address this data gap, the USDA Food and Nutrition Service contracted with RTI International and its team members—Altarum Institute and researchers from the University of California, Agriculture and Natural Resources, Nutrition Policy Institute—to conduct the WIC Nutrition Education Study. This study consisted of two phases. Phase I provided a comprehensive, nationally representative description of WIC nutrition education policies, practices, and features in 2014, based on surveys of local WIC agencies and sites and in-depth interviews with a subset of these sites (USDA, FNS, 2016). Phase II was a methodological study, conducted in six sites during 2015–2016, to test an approach to determine its feasibility for a national evaluation. The Phase II study included (1) a process evaluation that characterized the delivery of WIC nutrition education and (2) an impact evaluation that used a longitudinal, exposure-response design to assess the influence of WIC nutrition education on participants’ nutrition and physical activity attitudes and behaviors. The Phase II study was intended to determine if this approach could be used in a national evaluation study. Results indicate that a national study may not be feasible, but that other approaches may achieve similar goals on a smaller scale. On Thursday, September 27, at 10 a.m. PT (1 p.m. ET), join this webinar to learn about the impact of health laws and policies on increasing fruit and vegetable intake and making food accessible and affordable. This is the first in a series of webinars about the role of law and policy in helping to achieve Healthy People 2020 objectives. The webinar is based on a recent report co-authored by the Nutrition Policy Institute’s Pat Crawford. You’ll learn key findings about using law and policy interventions to increase fruit and vegetable intake from the report authors and hear how a large city used business regulation to improve availability of staple foods—including fruits and vegetables—in retail settings. The goal of the Healthy People Law and Health Policy project is to highlight how evidence-based legal and policy interventions and strategies can facilitate progress toward Healthy People objectives by improving community health and well-being. In addition to reports and webinars, the project includes “Bright Spots,” or success stories, that highlight successful policy interventions that have led to improved health outcomes. Join the discussion and learn how policy efforts improve health. The project is a collaboration between the HHS Office of Disease Prevention and Health Promotion (ODPHP), the Centers for Disease Control and Prevention (CDC), the CDC Foundation and the Robert Wood Johnson Foundation. Learn more and register for the webinar. The Equitable Food Initiative (EFI) is a multi-stakeholder program that partners with growers and retailers in the produce industry to create a more transparent food chain, safer food and healthier places to work. Lilian Autler of the EFI Workforce Development team will provide an overview of the results of EFI’s 2017 impact evaluation report with a focus on EFI’s positive impact on the lives of farmworkers. Fair Trade USA is the leading certifier of Fair Trade Certified products, working with producers and workers in more than 50 countries. Nathalie Marin-Gest, director of Fair Trade’s produce and floral program, will speak about that program, including a review of agricultural issues on all sides of the border and related impact from the more than 1.5 billion pounds of produce sold on Fair Trade terms that has generated significant improvements in the lives of farmers and workers. Watch the recording and view the slides of Autler and Marin-Gest's presentation. Nutrition Policy Institute Director Lorrene Ritchie will be featured in a webinar titled "The Healthy Communities Study: How Community Programs and Policies Are Related to Children's Health." Hosted by the National Collaborative on Childhood Obesity Research (NCCOR), the webinar will provide a brief overview of the Healthy Communities Study, the results of which suggest that targeted investments in community programs and policies can contribute to the improved nutrition and physical activity of children. The webinar will also highlight several findings from the Healthy Communities Study recently published in Pediatric Obesity. The host of the webinar, NCCOR, brings together four of the nation's leading research funders—the Centers for Disease Control and Prevention (CDC), National Institutes of Health (NIH), Robert Wood Johnson Foundation (RWJF), and U.S. Department of Agriculture (USDA)—to address the problem of childhood obesity in America. The September 2018 issue of the Nutrition Policy Institute (NPI) Research to Action news brief examines school nutrition programs. School lunch and breakfast, together with the other child nutrition programs, make a key contribution to students’ success at school and play an indispensable role in their health and development. Read about NPI’s leading research on school nutrition programs and find out how you can help support these important programs. The Nutrition Policy Institute’s Pat Crawford DrPH, RD, is one of four authors (with Lauren Dunning JD, MPH; Manel Kappagoda JD, MPH; and Jean C. O’Connor JD, MPH, DrPH) of a seminal Healthy People 2020 report, The Role of Law and Policy in Achieving the Healthy People 2020 Nutrition and Weight Status Goals of Increased Fruit and and Vegetable Intake in the United States.The report was released today by the Healthy People 2020 Law and Health Policy Project, a collaboration between the CDC Foundation, the Robert Wood Johnson Foundation and the U.S. Department of Health and Human Services (HHS). The report highlights the state of laws and policies related to the Healthy People nutrition and weight status topic area, specifically increasing the intake of fruits and vegetables. Healthy People 2020 is a national initiative supported by the HHS Office of Disease Prevention and Health Promotion that provides science-based, 10-year objectives to improve the health of all Americans. Healthy People 2020 serves as a tool for the federal government, states, communities and many other public- and private-sector partners to use in setting strategies to address health challenges and improve health. This training will discuss elements of data management to keep in mind while designing study protocols involving data collection, as well as a brief look into initial data management steps to take once data has been collected. Topics will include: ID creation, data security, an overview of the strengths and weaknesses of a variety of data collection methods, data validation, variable naming conventions, codebook creation and an overview of some descriptive statistics used to check data quality. Hilary Seligman MD, one of the nation's foremost experts on the health implications of food insecurity, discusses how to address a complex social problem through programs, policies and partnerships. Emerging evidence supports the long-held contention that food insecurity impacts health. Dr. Seligman will review this evidence and new insights into its economic implications. She will then examine the concept of strategic science and how it can be used to make research more impactful, using examples from her own work developing food security programs (such as EatSF), examining policies that support food security (such as SNAP) and partnering with community-based organizations who share these goals (such as Feeding America). An NPI-funded study by UC Berkeley graduate student Isabel Rangel is featured in a Politico article by Helena Bottemiller Evich. The article focuses on immigrants who are turning down federal food aid because they fear the Trump administration could bar them from getting a green card if they accept the aid. Rangel’s research is mentioned in the article, which quotes her: “She said they described dealing with ‘constant anxiety,’ even when they've decided to keep using programs like WIC, Medicaid and food stamps. They're worried that their documentation status will be somehow be jeopardized by participating in these health programs. They say: 'I can't stop using these programs because my children need them, but I know I'm risking my future and the future of my children.'" Rangel has been exploring how the current anti-immigrant climate is affecting the ways that mixed-status families, composed of at least one undocumented parent and one documented child, are accessing health and nutrition programs in California. Rangel received her MPH from UC Berkeley and is a graduate of UCLA where she majored in Anthropology and minored in Public Health and Labor and Workplace Studies. Her passion for addressing Latinx health inequities stems from her experiences of being raised in rural farmworker communities both in Mexico and in California’s Central Valley. Childhood Obesity has published a special issue on policies, programs and best practices in early care and education settings that was developed by Nutrition Policy Institute Director Lorrene Ritchie and coordinated by Ritchie and Danielle Lee. Published on September 1, 2018, the issue includes 12 articles as well as a remembrance of Susie Nanney, who worked to improve children's and family health in underserved and rural communities, including in early care and education settings. In addition to leading the development of the special issue, Ritchie co-authored a paper in the issue with Danielle Lee, Klara Gurzo, Sallie Yoshida, Elyse Homel Vitale and Ken Hecht: Compliance with the New 2017 Child and Adult Care Food Program Standards for Infants and Children before Implementation. The Supplemental Nutrition Assistance Program (SNAP), known as CalFresh in California, is the nation’s most important anti-hunger program. CalFresh provides critical support to low-income families while strengthening the local economy. The Nutrition Policy Institute has created a series of fact sheets that show how CalFresh benefits each of California's 58 counties. Isabel Rangel will present the results from her capstone project exploring how the current anti-immigrant climate is affecting the ways that mixed-status families, composed of at least one undocumented parent and one documented child, are accessing health and nutrition programs in California. Rangel received her MPH from UC Berkeley and is a graduate of UCLA where she majored in Anthropology and minored in Public Health and Labor and Workplace Studies. Her passion for addressing Latinx health inequities stems from her experiences of being raised in rural farmworker communities both in Mexico and in California’s Central Valley. Tia Shimada, director of programs at California Food Policy Advocates, and Lorrene Ritchie, director of the Nutrition Policy Institute and UC Cooperative Extension specialist, discuss how research can—and should—shape public policy. They will draw on years of partnership between advocates and academic researchers to share lessons learned about designing, conducting and disseminating policy-focused research. They will also talk about how advocates work with researchers of all stripes—from tenured faculty to think-tank data wonks—to advance state and federal policy. Mark Bell, vice provost of strategic initiatives and statewide programs for the University of California Division of Agriculture and Natural Resources, will talk about the interrelationship of the University of California Division of Agriculture and Natural Resources’ (UC ANR) strategic initiatives, statewide programs, program teams and workgroups and the new UC ANR public value statements. UC ANR improves the lives of Californians through its research and extension in the areas of agriculture, the environment, natural resources management, and human and community development. The division develops and delivers solutions to local problems in such areas as farming, nutrition, veterinary medicine, water quality and conservation, and offers programs for youth and families. The effects of these efforts have been widespread—from the air we breathe, the water we drink, the food we eat, and the fibers that clothe us, to the programs that sustain our natural environments and provide educational programs for inner-city at-risk youth. Food insecurity win California’s public university system: What are the risk factors? Nutrition Policy Institute Director Lorrene Ritchie presents "School Meals in the 21st Century: Using Technology and Design Innovation" at the Society for Nutrition Education and Behavior 2018 Annual Conference in Minneapolis, Minnesota. She will discuss results from a study of school food service redesign to improve meal participation and dietary intake. The results have been used to inform policy related to targeted technological interventions, point of sale and staff promotions to improve school meal participation rates, improve participant diet quality and variety, and decrease obesity in school meal participants. Earlier this year, Ritchie was honored as a Gold Author by the Society's Journal of Nutrition of Education and Behavior (JNEB) in recognition of her many excellent manuscripts published in JNEB during the last ten years. Action to progress food and nutrition policy in Australia has not been successful in the past decade even though diet is the leading contributor to the burden of disease and the latest release of national nutrition survey results convincingly demonstrate the nutrition problems. Political responses in the form of programs or interventions can best be described as patchy. Serious questions remain about the capacity of the three tiers of government to plan, coordinate and implement effective solutions. Andrea Begley, senior lecturer in dietetics and public health at the School of Public Health at Curtin University in Western Australia, will discuss current attempts to improve diet quality, as well as ideas for furthering food and nutrition policy in Australia. The 10th Biennial Childhood Obesity Conference (COC), to be held July 15-18, 2019 in Anaheim, California, invites individuals and organizations engaged in researching, developing, implementing and evaluating policy and environmental strategies that address root causes of childhood obesity to submit proposals for consideration for inclusion in the 10th Biennial COC program. The theme of the conference is "Beyond Obesity: Tackling Root Causes." The deadline for submission of proposals is Friday, August 3, 2018. In addition, the call for pre-conference session proposals will open in fall 2018. On June 15, 2018, the Nutrition Policy Institute lost a colleague and friend, Susie Nanney. Susie was an associate professor at the University of Minnesota where she served as director of the population health division. She was the founding director of the Health Equity in Policy Initiative for the Program in Health Disparities Research. Her research focused on obesity prevention, hunger relief, health disparities and policy. She worked to improve children’s and family health in underserved and rural communities. We will miss her as a colleague and as a champion in promoting population health and reducing health disparities. An undergraduate scholarship is being established in her name at the University of Minnesota. The purpose of the fund is to provide financial assistance to undergraduate students with financial need. Donate to the Susie Nanney Scholarship Fund. The Nutrition Policy Institute's Christina Hecht and Laura Vollmer present a workshop during the National Association for Family Child Care Conference in Chicago, Illinois. The workshop, Just Add Water! Healthy Beverages in Child Care, covers the importance of drinking water, not sugary drinks, for health. Attendees will learn the latest news on drinking water and beverages in child care. Results from a new study on nutrition standards in family child care, new beverage guidance for young children, and educational and promotional resources will be provided to help attendees put new drinking water guidance into practice. The workshop is at 10 a.m. in the Tegel room. NPI Brown Bag: Marianne Bitler on "Impacts of Federal Nutrition Assistance Programs"
Marianne P. Bitler, professor in the UC Davis Department of Economics, will discuss research on the effects of the Special Supplemental Nutrition Program for Women, Infants & Children (WIC) on participants' food acquisition, diet and health outcomes. She will also discuss research on the long-term effects of the Supplemental Nutrition Assistance Program (SNAP) (previously known as the Food Stamp program) on participants' earnings and use of disability benefits. NPI Brown Bag: Ingrid Feng on "Farming for Native Bees: Seeking a Solution to the Honey Bee Crisis"
Ingrid Feng, whose experience includes work as a native bee researcher at the UC Berkeley Urban Bee Lab, discusses the decline of honey bee populations and the potential of using wild native bees as an alternate pollination source for our nation's crops. Research shows that wild native bees have the capacity to pollinate just as efficiently as honey bees. Support for native bees in agricultural, wild and urban settings has implications for agriculture, conservation and public health, however. While native bees may alleviate the immediate honey bee crisis, they do not resolve the underlying problems resulting from dependence on one bee species for crop pollination. View the slides for this presentation. Lorrene Ritchie presents Community Programs, Policies and Practices Related to an Increased Prevalence of Healthy Weight: The California Healthy Kids Study at Nutrition 2018, the American Society for Nutrition’s annual conference. She will be discussing characteristics of successful programs to promote healthy weight among middle schoolers. Pam Ronald PhD, a Distinguished Professor at the University of California, Davis, and Director of the Institute for Food and Agricultural Literacy, discusses how integrated approaches are needed to enhance sustainable agriculture. The genetic engineering of crops launched in 1996; the marker assisted breeding of today and the genome editing of tomorrow are examples of a continuum of new technologies aimed at helping farmers produce food in a productive and ecologically based manner. Learn more. The University of California Division of Agriculture and Natural Resources/Nutrition Policy Institute are seeking outstanding UC students to apply for the 2018-19 UC Global Food Initiative Fellowship in Communications/Outreach. The UC ANR GFI Fellowship in Communications/Outreach focuses on community outreach and education, specifically: 1) educating the public through written, visual, and online communications about nutrition policy, food security, federal food programs, food waste reuse, childhood obesity prevention and other nutrition and food policy topics, and 2) educating the public through written, visual, and online communications about UC ANR’s impact on the above topics. The application deadline is Monday, May 21, 2018. For more information and application instructions, please see the UC ANR GFI Fellow in Communications flyer. Anna Lee, Guenet Sebsibe and Jenny Wang of the Alameda County Public Health Department will discuss policy, program, and partnering efforts to increase health equity in Alameda County. Policy efforts include the Place Matters program, a local policy initiative addressing land use and transportation policy issues that involves collaboration with public health programs and community organizations. Program efforts include the Healthy Retail Program, which works with small corner stores in food deserts to offer healthier options. Partnering efforts include collaborations with schools, early childhood- as well as youth-serving organizations, parks and recreation centers, faith-based institutions, retail stores, low-income senior and family housing, and grassroots and community-based organizations. Suzanna Martinez participated in the UC Global Food Initiative Food Access and Security Basic Needs subcommittee annual meeting at UC Santa Cruz. The meeting was led by Tim Galarneau and Ruben Canedo and attended by representatives from all 10 UC campuses and UC Agriculture and Natural Resources. This committee of the UC Global Food Initiative convened to discuss achievements during the previous year and to plan activities for the coming year. Rural food banks face unique challenges in trying to help families reduce food insecurity. The California Association of Food Banks is working to support its rural members to address the challenges of rural food banking. Cooperative Extension and SNAP-Ed are also key partners with food banks and their affiliated agencies supporting the distribution of healthy foods and associated nutrition education. The UC ANR Nutrition Policy Institute is working with food banks in California and around the country to develop and implement policies that support the provision of more healthy foods in food banks. Join us for a webinar on rural food banking on Thursday, May 3 at 1 pm PT. This webinar will bring together key stakeholders and explore the challenges of transporting, storing and distributing healthy foods to rural communities. Participants will learn about findings from an assessment of rural food banks in California identifying issues and concerns about the transportation, storage and distribution of healthy food. Participants will also hear directly about unique solutions that are being successfully implemented by rural food banks in California and other states. The webinar will include a brainstorming session to identify other ways that we can support rural food banks. Maggi Kelly, professor and cooperative extension specialist in the Environmental Science, Policy and Management department and affiliated professor of Geography at UC Berkeley, will speak on how to use mapping technology in public health and nutrition work. Spatial data collection, analysis and visualization has changed dramatically in the last decade and we now are able to use this 21st-century mapping toolkit to address contemporary challenges in public health, nutrition, food systems, food security and obesity research, among other fields. In this talk, Kelly will review recent advancements in data, analysis tools and communication, and highlight key cases from her work and elsewhere that illustrate the exciting and dynamic geospatial landscape. Promoting healthy beverage intake, particularly among children and adolescents, has emerged in recent years as a policy and research priority. Because different dietary assessment methods are subject to specific and unique limitations that could influence study findings, it is important to understand what assessment methods are available, what properties they have and what methods are typically used in the scientific literature. A new report, Assessing Beverage Intake in Children and Adolescents: State of the Science, Recommendations, and Resources for Evaluation and accompanying systematic review begin to address these issues. The report was authored by researchers from the University of North Carolina Gillings School of Public Health, the University of California Nutrition Policy Institute, Stanford Medicine, the University of California San Francisco Philip R. Lee Institute for Health Policy Studies, and was supported by Healthy Eating Research. The report provides guidance on using five main types of assessment methods for measuring beverage intake, including a description of how to implement the method, recommendations for use, and advantages and limitations. The systematic review (forthcoming) describes the state-of-the-science in measuring children's beverage intake and points toward future research needs in this area. Improved measurement techniques will help establish whether progress is being made toward ensuring that all children in the U.S. have healthy beverage consumption habits. Given the important role that beverage intake plays in a range of children’s health and developmental outcomes, researchers and practitioners from a variety of areas should be invested in developing and applying thoughtful measurement techniques for assessing children’s beverage consumption. University of California Office of the President (UCOP) staff celebrated Take Our Daughters and Sons to Work Day with a myriad of activities led by volunteers on a range of topics. Nutrition Policy Institute's Dani Lee, also representing the Division of Agriculture and Natural Resources, taught kids how to read the Nutrition Facts Label to tell if a drink has added sugars. A group of Nutrition Policy Institute staff attends the 12th annual meeting of Healthy Eating Research (HER) in Nashville, Tennessee, to present their research funded by HER. Lorrene Ritchie PhD, RD, director of NPI, presents with California Food Policy Advocates partner Elyse Homel Vitale MPH on “Nutrition in Licensed Child-Care Centers and Homes in California: Compliance With the 2017 CACFP Nutrition Standards and 2010 Healthy Beverages Standards.” Ritchie also presents a poster on “Relationship of School and Community Programs, Policies and Practices with Child BMI: the California Healthy Kids Study.” In a session dedicated to helping grantees understand how research and communicating research results effectively to the right audiences can influence policy debates, NPI Assistant Researcher Lauren Au PhD, RD, discusses the tools she uses to reach and influence policymakers. Au also presents on “Eating School Meals Daily Is Associated with Healthier Dietary Intakes: The Healthy Communities Study.” NPI Senior Policy Analyst Christina Hecht PhD presents with Angie Craddock ScD, MPE of the Harvard T.H. Chan School of Public Health on “Early Adopters: Current Practices and Preliminary Findings in States Adopting School-Based Water Quality Testing Programs” and Hecht also presents with Anisha Patel MD, MSPH, MSHS of Stanford University on “Developing, Validating and Feasibility Testing a Cost-effective Photo-evidence Method to Assess Effectiveness of Access to Drinking Water in Schools.” NPI Director of Policy Ken Hecht LLB moderates the panel on “Innovative Strategies to Promote Water Access and Consumption” and NPI Associate Director of Research Gail Woodward-Lopez MPH, RD moderates the panel on “Schools II: Approaches to Healthy Eating and Wellness in Schools.” Healthy Eating Research is a national program of the Robert Wood Johnson Foundation (RWJF) that supports research on environmental and policy strategies that have strong potential to promote healthy eating among children, especially among lower-income and racial and ethnic populations at highest risk for obesity. Research is conducted in order to advance RWJF’s efforts to reverse the childhood obesity epidemic and help all children in the United States to grow up at a healthy weight. Suzanna Martinez attended the 2018 PRIDE (Program to Increase Diversity among Individuals Engaged In Health-Related Research) annual meeting, which took place in Bethesda, Maryland. PRIDE is an all-expense-paid Summer Institute, research education and mentoring initiative sponsored by the National Heart, Lung, and Blood Institute (NHLBI). Last August, Martinez completed a Summer Institute training program in Behavioral Sleep and Medicine at New York University’s Langone Medical Center. At the PRIDE annual meeting, she networked with junior faculty working in the area of chronic disease prevention in the Latino community, and she made several contacts, including some for future collaboration. The Summer Institute initiative addresses the difficulties experienced by junior investigators and transitioning postdoctoral scientists in establishing independent academic research careers and negotiating through the academic ranks. The primary outcome of this program is to increase the number of scientists and research-oriented faculty who are from backgrounds currently under-represented in the biomedical sciences and those with disabilities, by preparing them to successfully compete for external funding for scientific research in heart, lung, blood, and sleep (HLBS) disorders. As part of its 75th anniversary celebration, the UC Berkeley School of Public Health honored Nutrition Policy Institute Senior Director of Research Pat Crawford DrPH, MPH, RD as one of its 75 most influential alumni in recognition of her significant contributions to reduce the epidemic of childhood obesity in California and across the country. Crawford is also an adjunct professor at the School and co-founded and directed the Center for Weight and Health at UC Berkeley for 15 years before joining the Nutrition Policy Institute. The U.S. Department of Agriculture’s (USDA) Special Supplemental Nutrition Program for Women, Infants, and Children (WIC) was established to safeguard the health of low-income pregnant women and infants who are at nutritional risk. 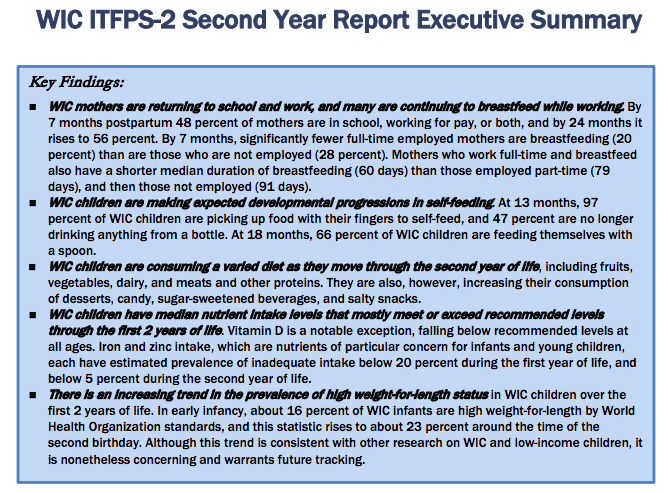 The WIC Infant and Toddler Feeding Practices Study-2 (WIC ITFPS-2), also known as the “Feeding My Baby” Study, captures data on caregivers and their children over the first 5 years of the child’s life after WIC enrollment to address a series of research questions regarding feeding practices, associations between WIC services and those practices, and the health and nutrition outcomes of children receiving WIC. The study previously produced two reports, the Intentions to Breastfeed Report and the Infant Year Report. The newest report, the Second-Year Report, focuses on caregivers’ employment, school and child care circumstances, as well as the feeding progressions, dietary intake and weight status of children from birth through around 24 months. Key findings show positive nutrition outcomes among WIC participants. NPI Director Lorrene Ritchie and Assistant Researcher Lauren Au are co-authors of the new study. Nutrition Policy Institute Senior Policy Advisor Christina Hecht presents an interactive workshop on “Offering help with 'offer': Meeting the new Child and Adult Care Food Program (CACFP) water provisions” as part of the National Child Nutrition Conference in San Antonio, Texas. See the schedule. The final evaluation report of the Community Health Initiative, completed by Kaiser Permanente Washington Health Research Institute, Center for Community Health and Evaluation, and University of California, Nutrition Policy Institute, is also available. In addition, you can read the Nutrition Policy Institute’s Research to Action news brief for an overview of the Kaiser Permanente Community Health Initiative project. Angie Tagtow is a strategic advisor with more than 25 years of experience working at local, state, federal, and international levels in agriculture, food and nutrition policy; public health; and food and water systems. In 2014, she was appointed by President Barack Obama to serve as the Executive Director for the USDA Center for Nutrition Policy and Promotion, where she co-led the development and launch of the 2015-2020 Dietary Guidelines for Americans. Tagtow will talk about the process of developing the 2020 Dietary Guidelines for Americans (DGAs) as well as proposed cuts to the federal nutrition education and food and nutrition programs, touching on the nutrition and health status of the U.S. population, the background of the DGAs, the anticipated process of developing the 2020-2025 DGAs and opportunities for engagement and action. Researchers involved in prominent college student food insecurity studies around the country responded to an April 11 article in USA Today by James Bovard entitled “Starvation issues in universities? The real college problem is obesity.” The researchers, including Nutrition Policy Institute’s Suzanna Martinez, pointed out Bovard’s errors of fact and lack of compassion for students who have limited financial resources and/or support from their families. The researchers’ comments were published in an April 15 letter to the editor in USA Today. In addition to Martinez, the other researchers who signed the letter are Nick Freudenberg of City University of New York School of Public Health, Sara Goldrick-Rab of Temple University and Aydin Nazmi of California Polytechnic State University. Nutrition Policy Institute Assistant Researcher Lauren Au PhD, RD, will speak about nutrition research as part of the American Society for Nutrition’s “The Farm Bill and Beyond: Advocating for Nutrition and Research” webinar. The webinar aims to inform ASN members about the 2018 Farm Bill and its impact on nutrition-related work and research. With drastic cuts proposed for many nutrition research funding agencies, federal support for nutrition research funding, federal nutrition programs and nutrition-related public health initiatives is more important now than ever before. The webinar will provide an overview of the Farm Bill, explore the nutrition-related elements of the Farm Bill, and review the overall importance and impact of advocacy for nutrition and research, as well as provide insight to best practices and approaches to overcome challenges. Au also recently co-authored The Academy of Nutrition and Dietetics’ Priorities in the 2018 Farm Bill. The UCLA MCH Nutrition Leadership Training Program hosts a policy seminar on the 2020-2025 Dietary Guidelines for Americans (DGA) during National Public Health Week featuring Nutrition Policy Institute Director Lorrene Ritchie PhD, RD and former Executive Director of the USDA Center for Nutrition Policy and Promotion Angie Tagtow MS, RD. According to the USDA, the 2020-2025 edition of the DGA will take a lifespan approach and include new nutrition guidance for pregnant women, infants, and toddlers up to 2 years of age, and those old than 65 years. Ritchie and Tagtow will highlight the process for developing the Dietary Guidelines; the role science plays in informing the Dietary Guidelines; actors and stakeholders engaged in the development process; and strategies we need to take to preserve and protect a significant investment in Americans’ health. In addition, the latest research on best feeding practices for infants and toddlers will be presented, including results from the WIC Infant and Toddler Feeding Practices Study. Sonya Zhu is a Master of Public Health-Master of Public Policy (MPH-MPP) candidate at UC Berkeley and a UC ANR Global Food Initiative (GFI) Student Fellow, based at the Nutrition Policy Institute. She will present the results of her GFI/MPH Maternal & Child Health capstone project. Using data from the Healthy Communities Study (HCS), Zhu examined the association between household food insecurity and child adiposity, dietary intake and diet-related behaviors. Nutrition Policy Institute Assistant Researcher Lauren Au is co-author on the Academy of Nutrition and Dietetics' Priorities in the 2018 Farm Bill. The Academy's guiding principle for farm bill recommendations is a commitment to policies that improve health for everyone, especially those who are most vulnerable to food insecurity. Anne Megaro, UC ANR's Government & Community Relations Director, will talk about the importance of communicating science with non-scientists to affect science-based policymaking and how this can most effectively be accomplished. Megaro earned her B.S. in Animal Science and Management from UC Davis and her Ph.D. in Animal Science from Cornell University. Her doctoral research focused on bioactive fatty acids in milk and their impact on human health. Upon graduation, in an effort to pursue goals of serving as a liaison between scientists, consumers, and government entities on issues involving agriculture, nutrition and food safety, Anne was competitively selected to participate in the AAAS Congressional Fellowship in Washington, D.C. Upon completion of the fellowship, Anne moved back to California and was hired to be the consultant to the California State Senate Committee on Agriculture. In this position, she was responsible for writing clear, comprehensive, and non-partisan analyses for all bills that came before the committee; designing and organizing committee oversight and informational hearings; and collaborating with legislators, stakeholders, government agencies and the public to resolve concerns or issues related to bills or policies. Currently, Megaro guides UC ANR employees in nurturing relationships with government officials and community members. Nutrition Policy Institute Senior Policy Advisor Christina Hecht is on the "Lead in Drinking Water: How Safe Is Safe and At What Cost?" panel that is part of the 27th California Water Policy Conference. This year’s theme “Water You Gonna Do?” brings together water leaders representing agricultural, environmental, urban, environmental justice, government, and private sector constituencies and perspectives, as well as interested individuals from the general public, to tackle California's water supply challenges. Dr. Zubaida Qamar, research project manager for the Mediators of Atherosclerosis in South Asians Living in America (MASALA) Study at University of California, San Francisco (UCSF), will provide a brief overview of the various community-based recruitment and retention strategies that have been successfully implemented for the participants of the MASALA Study. She will also describe some of the unique recruitment and retention challenges faced by the MASALA participants residing in and around the Bay Area and the approaches used to overcome these barriers. Such strategies could provide guidance to the recruitment and retention efforts of community-based intervention and disease-prevention studies for underserved groups, moving in the direction of eliminating health disparities. In a study conducted by the Nutrition Policy Institute based on Healthy Communities Study data and published in the Journal of the Academy of Nutrition and Dietetics, researchers examined the association between the frequency of participating in the National School Lunch and National School Breakfast Programs and children's dietary intakes. The study concluded that eating school breakfast and school lunch every day by U.S. schoolchildren was associated with healthier dietary intakes. The findings suggest nutritional benefits of regularly consuming school meals. John Reich PhD, Scientific Program Director of the Foundation for Food and Agriculture Research (FFAR), will speak about FFAR's work and funding opportunities. FFAR brings together leading experts to identify and investigate the researchable questions whose answers have the potential to enhance the economic and environmental resilience of our food supply. FFAR funds research in two broad categories—more productive/sustainable agriculture and better health through food—and seven Challenge Areas including: Food Waste and Loss, Protein Challenge, Water Scarcity, Innovation Pathway to Sustainability, Healthy Soils/Thriving Farms, Urban Food Systems, and Making My Plate Your Plate. Shoppers purchasing fruits and vegetables in stores located in low-income neighborhoods in California may pay more for those fruits and vegetables than shoppers in other neighborhoods, according to a study that examined prices in a large sample of stores throughout the state. Published online in March 2018 in the journal Public Health Nutrition, the study, conducted by researchers at UC’s Nutrition Policy Institute, involved more than 200 large grocery stores, 600 small markets, and 600 convenience stores in 225 low-income neighborhoods (where at least half of the population was at or below 185% of the Federal Poverty Level) and compared observed prices to purchased price data from chain grocery stores in the same counties during the same months. The Nutrition Policy Institute collaborates with Governor Jerry Brown and other California officials and agencies to announce March 5-9, 2018, as Food Waste Prevention Week in the State of California. The unprecedented collaboration grew out of a meeting held in February 2017 in which the Public Health Alliance of Southern California and the UC ANR Nutrition Policy Institute jointly convened state agencies delivering nutrition education programming to discuss the impacts of food waste and strategize solutions the agencies could advance together. The planning group identified an opportunity to generate and issue shared messaging during National Nutrition Month, a goal that has evolved into California’s inaugural Food Waste Prevention Week, a coordinated multi-sector effort to raise awareness about the economic, environmental and social impacts of food waste in California. Stay tuned to the Nutrition Policy Institute's Twitter page and UC ANR's Twitter and Facebook pages for shareable resources, tips and ideas during the week, and join the Food Waste Reduction Hero Photo Challenge. The national epidemic of childhood obesity is well-recognized, yet the effect of community-based programs and policies on childhood obesity prevention is less well understood. This Healthy Communities Study paper, just published in Pediatric Obesity, examined the longitudinal relationship between the intensity of community-based programs and policies in 130 communities over 10 years and the body mass index of resident children. The study also examined whether these relationships differ by key family or community characteristics. The results indicate that over time, more intense community-based programs and policies are related to lower childhood body mass index, and that there are disparities by sociodemographic characteristics of families and communities, such as child grade, race/ethnicity, family income and parental education, as well as community-level race/ethnicity. Nutrition Policy Institute Director Lorrene Ritchie is an author of the study. The March 2018 issue of the Nutrition Policy Institute’s Research to Action focuses on the inaugural Food Waste Prevention Week, a weeklong campaign to raise awareness about the economic, environmental and social impacts of food waste in California. This unprecedented collaboration, spearheaded by the Nutrition Policy Institute and the Public Health Alliance of Southern California, is supported by the Governor, the Secretary of Agriculture, the State Superintendent of Public Instruction, and many other agency leaders in public health, natural resources management, nutrition and other sectors. Laura Rubin MPH will share findings from the last round of Kaiser Permanente’s 10-year Healthy Eating, Active Living (HEAL) Zone Initiative, which ended in June 2017. The initiative funded place-based collaboratives to work across multiple strategies and sectors to increase access to healthy foods and opportunities for physical activity. Rubin will review the population-level findings, share stories of the successes and lessons learned, and share a short video and reflections from the sites. Lorrene Ritchie will be speaking and Ken Hecht will be moderating a session at the National Anti-Hunger Policy Conference in Washington, D.C., on Monday, February 26, 2018. The session is on "Brand New Research to Help You Make a Success of New Child and Adult Care Food Programs (CACFP) Meal Patterns" and will provide the most recent research and insight on CACFP programs and provider practices and strategies. The National Anti-Hunger Policy Conference, co-sponsored by the Food Research & Action Center (FRAC) and Feeding America, and in cooperation with the National CACFP Forum, draws anti-hunger and anti-poverty advocates; federal, state and local government officials; child advocates; representatives of food banks and food rescue organizations; sponsoring organizations and nutrition and anti-obesity groups. Punam Ohri-Vachaspati PhD, MS, RD, professor of nutrition in the School of Nutrition and Health Promotion at Arizona State University (ASU) discusses the role of policy and environment in shaping behavior and health outcomes. Ohri-Vachaspati leads the ASU Food Environment and Policy Research Group. She teaches graduate-level courses and mentors students interested in exploring public health approaches for improving healthy food access, eating behaviors and health outcomes. In 2016-17, Ohri-Vachaspati completed the Robert Wood Johnson Foundation Health Policy Fellowship, working on health care and nutrition issues in Senator Kirsten Gillibrand’s (D-NY) office. Ohri-Vachaspati will be speaking about her NIH-funded research projects. Christina Hecht and Laura Vollmer of the Nutrition Policy Institute and the National Drinking Water Alliance will present an interactive session on "Forging a Path Ahead: Developing a Roadmap to Healthy Beverages" at the Notah Begay III (NB3) Foundation's Healthy Beverage Summit. The NB3 Foundation is a national, award-winning Native American nonprofit organization dedicated to reducing Native American childhood obesity and type 2 diabetes. Held in Albuquerque, New Mexico, the Healthy Beverage Summit brings together community members, organizations and agencies committed to reducing the consumption of sugary beverages among Native American children. The Nutrition Policy Institute’s Lorrene Ritchie and Wendi Gosliner are co-authors of "Sugar-Sweetened Beverage and Water Intake in Relation to Diet Quality in U.S. Children" to be published in print in the March 2018 issue of the American Journal of Preventive Medicine and available online now. This study examines whether children’s sugary beverage and water intakes are associated with diet quality and total energy intake. The study concluded that children who consume sugary beverages have poorer diet quality and higher total energy intake than children who do not consume sugary beverages. The study recommended that interventions for obesity and chronic disease focus on replacing sugary beverage consumption. Equitable Food Initiative gave a presentation on creating a harassment-free culture in California to a joint hearing of the Senate Judiciary Committee; Senate Select Committee on Women, Work, and Families; and Legislative Women’s Caucus. Nutrition Policy Institute's Ron Strochlic's work with colleagues at the Berkeley Food Institute was cited. Read the research: Improved Farm Labor Conditions. Hear the podcast: Harvesting Equitable Food. In WalletHub's survey of the healthiest and unhealthiest cities in the United States, Nutrition Policy Institute Director Lorrene Ritchie discusses healthy lifestyles for city-dwellers, emphasizing the importance of having opportunities for healthy eating and active living in your neighborhood. Stutee Khandelwal MD, MPH, assistant professor of Medicine in the Department of Internal Medicine, UCSF Fresno Medical Education Program, will discuss dietary interventions for clinical practice. This is a special NPI Brown Bag seminar, in partnership with the UC Berkeley School of Public Health-Public Health Nutrition program, and the UC Berkeley-UCSF Joint Medical Program. This talk is oriented to students, medical residents and clinical practitioners, however NPI staff and NPI Brown Bag invitees are welcome and encouraged to join. We recommend attending via Zoom due to limited capacity. Nutrition Policy Institute Assistant Researcher Suzanna Martinez PhD, MS presented a talk on "College food security research: State of the science” on February 7 at the California State University “Addressing Basic Needs in the CSU: Supporting Student Success" conference, held at Sacramento State University. Co-presenting with Martinez was Cal Poly’s Aydin Nazmi. The conference featured a variety of speakers and breakout sessions to help equip campuses with knowledge to successfully develop and deliver basic needs services to their students. Daniel A. Rodríguez, Chancellor's Professor in the Department of City and Regional Planning at UC Berkeley, will discuss his research, which focuses on the relationship between transportation, land development, and the health and environmental impacts that follow. His most recent work focuses on the health and equity impacts of urban transportation policy. A majority of Professor Rodríguez’s work is driven by practical problems and finding solutions for planners and policy-makers. Working within the health, nutrition, economics, engineering, geography and public policy disciplines, he has examined how changes to the physical attributes of the environment, such as the location of bus routes, rail lines, supermarkets and trails, are related to changes in physical activity. Carmen Byker Shanks PhD, RD, associate professor of Food, Nutrition and Sustainable Food Systems at Montana State University and Food and Health Lab principal investigator, presented her research examining disparities in availability, affordability, quality and desirability of fruits and vegetables in rural versus urban food environments as measured by observational surveys, consumer sensory testing and total phenolic concentration. Her findings indicate that fruits and vegetables were significantly lower in quality and desirability in all three measures on the basis of rurality and that intervention strategies should aim to increase fruit and vegetable quality and desirability in rural food environments to promote consumption. Watch a video of this NPI Brown Bag. Jenny Mulholland-Beahrs, director of the California Outdoor Engagement Coalition, will provide an overview of the coalition’s vision, mission, priorities, partnerships and projects, and then lead a discussion. Through cross-sector partnerships, the coalition expands transformational experiences in the outdoors for youth who reflect the overall demographics of California. Partners include the National Park Service, California State Parks, the Sierra Club, Latino Outdoors and OutDoor Afro. The Nutrition Policy Institute has published a blog post on the UC ANR Food Blog detailing UC's work to identify and combat student food insecurity and housing insecurity, both of which threaten students' health as well as their academic achievements. Titled "No joke: the reality of the starving student and what UC is doing to help," the blog post traces the history of UC's involvement in the issue, from the first Student Food Access and Security Study authored by the UC ANR Nutrition Policy Institute's Lorrene Ritchie and Suzanna Martinez and UC Santa Barbara's Katie Maynard, to the most recent report, Global Food Initiative: Food and Housing Security at the University of California, which included NPI’s Ritchie and Martinez as contributors. Food and Housing Security at the University of California, a new report and executive summary, has been published by the UC Global Food Initiative. The new report builds on the initial Student Food Access and Security Study, conducted by the Nutrition Policy Institute’s Lorrene Ritchie and Suzanna Martinez, which found that 48 percent of the university’s undergraduates and 25 percent of its graduate students experience some level of food insecurity, and led to UC actions to help students regularly access nutritious food on campus and off. The new report, which included NPI’s Ritchie and Martinez as contributors, provides information on the university’s latest data collection efforts and strategies for addressing basic needs (food and housing) security. The Global Food Initiative also published a summary of UC's efforts to address student food and housing security since the Global Food Initiative was launched. The December 2017 issue of the Nutrition Policy Institute’s Research to Action focuses on the critical role that regional and rural food banks and their affiliated food pantries play in distributing emergency food to low-income households and suggests ways we can help support these food banks. Nutrition Policy Institute Director Lorrene Ritchie will present a talk on “Assessing Community Programs, Policies and Practices Related to Obesity Prevention” as part of the National Institutes of Health Pathways to Prevention Workshop: Methods for Evaluating Natural Experiments in Obesity. In her talk, Ritchie will summarize lessons learned from several studies assessing community program, policies and practices targeting pediatric obesity prevention, including Kaiser Permanente’s Community Health Initiative, the NIH-funded Healthy Communities Study and the Robert Wood Johnson Foundation-funded California Healthy Kids Study. The findings from these observational studies provide important information regarding what communities are doing to address pediatric obesity. They suggest common approaches already occurring in many communities that can inform future efforts to address childhood obesity. UC Berkeley Department of Environmental Sciences, Policy and Management Associate Professor Dr. Alastair Iles and doctoral candidate Maywa Montenegro gave a presentation at the Nutrition Policy Institute called “A Conversation about Genetically Modified Food – Part 1: Rethinking the GMO debate: Science and undone science.” They were invited to speak in response to the recently released film Food Evolution, and presented their perspective on genetically modified food as it relates to ecology, human health, knowledge and culture, and economics through three cases: glyphosate, golden rice and dicamba. They recommended a resource for keeping up to date on the genetically modified food discussion: GM Watch. Bayer Neighborhood Park and Garden - Bringing People Together is a recent video produced by the Nutrition Policy Institute for Kaiser Permanente. The video shows an example of a built environment change, part of many community change initiatives, that UC Nutrition Policy Institute has evaluated to increase physical activity and healthy eating in communities in Northern California for Kaiser Permanente. This video and the program featured in it was supported by Kaiser Permanente’s community investments and produced by the UC Nutrition Policy Institute. Nutrition Policy Institute Senior Director of Research Pat Crawford recently published an article on the UC Agriculture and Natural Resources Food Blog titled Joining forces to promote child health and wellness. In the article, Crawford discusses ways that medical and dental professionals can collaborate to improve the medical and dental health of children by helping children and families find ways to reduce consumption of sugar-sweetened beverages. Nutrition Policy Institute researchers will be presenting on a range of topics at the American Public Health Association's 2017 Annual Meeting as part of the Food and Nutrition Section’s program. The largest public health meeting in the world, APHA 2017 takes place in Atlanta, Georgia, from November 4 to 8, 2017, and is expected to bring together more than 12,000 researchers and professionals from across the U.S. and around the world to network, educate and share experiences. NPI’s presentations focus on the wide range of topics that NPI researches, including breastfeeding among women on WIC, school wellness policies, communities and child nutrition (part of the Healthy Communities Study) and compliance with the new CACFP nutrition standards in childcare centers and homes in California. Lorrene Ritchie and Suzanna Martinez of the Nutrition Policy Institute and Ruben Canedo of UC Berkeley and the UC Global Food Initiative will discuss food insecurity at the 11th Annual Sugar, Stress, Environment, and Weight (SSEW) Symposium. This year’s theme is Hungry for Change: Food Insecurity, Stress, and Obesity, and the symposium will take place on October 25, 2017, at UCLA. Registration is free. Nutrition Policy Institute Academic Coordinator Dana Gerstein presents a talk at NPI on “Space to Grow, Evaluation Methods for Built Environments: Public Parks and Green Spaces” on Monday, October 23, 2017 at noon. Gerstein’s presentation will describe an evaluation methodology used to measure the impact of a built environment intervention, Chicago's Space To Grow Initiative, on the health and wellness of a community. The implementation of such evaluation methods could provide evidence that a healthy built environment can be a solution to health inequities. Regular access to public parks and green spaces offer numerous health and wellness benefits for individuals and communities, including physical activity, increased diversity of play, positive social interactions, increased resilience, stress reduction, improved social emotional health, improved academic outcomes and increased social capital. Nutrition Policy Institute’s Suzanna Martinez will participate in the Second #RealCollege Convening, October 23-24 in Philadelphia, Pennsylvania. The national convening is led by Wisconsin HOPE Lab and provides an opportunity to interact and learn from leaders working to reduce food and housing insecurity. Nutrition Policy Institute Senior Policy Advisor Christina Hecht presented at a workshop on June 21, 2017 at the National Academies of Science, Engineering and Medicine on “Strategies to Limit Sugar-Sweetened Beverage Consumption in Young Children.” The proceedings of the workshop are now available. Hecht discussed the need for better data on young children’s hydration status and longitudinal changes in beverage intake, the efforts to make water the normative beverage after age-appropriate amounts of milk, and water safety issues. Hecht also reviewed water availability issues, and she described studies in which improving water access and offering beverage selection education in the school setting increased water intake among students. Hecht added that little research has been done in the child care setting to date, and she outlined new beverage standards for child care programs operating under the Child and Adult Care Food Program (CACFP) that are effective October 1, 2017: “Water must be offered throughout the day with visual cues.” In considering the current status of beverage intake among young children, Hecht suggested that a need exists to provide clear guidance to parents and caregivers on what, how and how much children should be drinking. A new fact sheet on the National Drinking Water Alliance website, Closing the Water Quality Gap, helps state and local health department staff who want to understand how state and local policy, as well as outreach and education, can be used to ensure access to safe drinking water for people who use private wells. The federal Safe Drinking Water Act (SDWA) regulates the nation’s public drinking water supply, safeguarding drinking water for the majority of U.S. residents. However, twelve percent of the U.S. population, or 34 million people, get their water from private wells, and these smaller water systems do not meet the federal definition of a public water system and therefore are not regulated by federal law. This regulatory gap can be addressed at state and local levels through the adoption of state and local policies. Educating stakeholders about the potential risks of these federally unregulated water systems can be an effective way to gain support for such policy changes. The Closing the Water Quality Gap fact sheet defines policy, discusses the role that health departments can play in policy change and provides examples of state and local policies that can be applied to federally unregulated wells. Just Food is a new 6-part podcast series about cultivating justice and health, produced by the Berkeley Food Institute in partnership with the UC Berkeley Advanced Media Institute at the UC Berkeley Graduate School of Journalism. A launch event, on Tuesday, October 3, 2017 from 5 to 7 pm, will feature a preview of the upcoming episode “Leveling the Playing Field,” a story about the nation’s first sugar-sweetened beverage tax in Berkeley—from how the measure came into law in 2014 to how the tax and the revenue it generates are shaping the health of Berkeley residents today. A panel discussion and Q&A session with experts and community members featured in the podcast will be followed by a reception. NPI Affiliate Researcher Kris Madsen, who also is the faculty director of the Berkeley Food Institute, will participate in the panel discussion; her research team recently conducted the first study to examine the impact of Berkeley’s soda tax on sugar-sweetened beverage consumption in low-income neighborhoods in Berkeley. Ed Wasserman, dean of the UC Berkeley Graduate School of Journalism, will provide opening remarks, and the panel discussion will be followed by comments from Sarah Bell, program director of the 11th Hour Project of the Schmidt Family Foundation, which provided funding for the podcast series. Jennifer Sowerwine PhD, Assistant Cooperative Extension Specialist and faculty member in the UC Berkeley Department of Environmental Science, Policy and Management, delivered a presentation at the Nutrition Policy Institute on “From Occupation to Collaboration: Establishing a community-university partnership at the UC Gill Tract Community Farm to address urban food insecurity and food justice.” Sowerwine's research interests include building equitable, economically viable and culturally relevant food systems in metropolitan areas that contribute to healthy communities, ecological diversity and sustainable livelihoods. She described the origin and creation of the innovative collaborative project between the community and the university at the UC Gill Tract Community Farm. As part of the presentation, she shared results from the recently completed Biennial Report on activities, outcomes and future visions for expansion at the farm. In support of the project, NPI staff will volunteer at the farm. Lorrene Ritchie gave a presentation to the National Academies’ Roundtable on Obesity Solutions about the Healthy Communities Study of the impacts of community efforts nationally on child nutrition. Colleagues joining Ritchie to present on different aspects of the Healthy Communities Study included Sonia Arteaga from the National Heart, Lung, and Blood Institute of the National Institutes of Health; Steve Fawcett from University of Kansas; Warren Strauss from Battelle; and Russ Pate from the University of South Carolina. Registration is open for the 11th Annual Sugar, Stress, Environment, and Weight (SSEW) Symposium to be held on October 25 on the UCLA campus. This year's theme is “Hungry for Change: Food Insecurity, Stress and Obesity.” The symposium is presented by the UCSF Center for Obesity Assessment, Study and Treatment (COAST) and the UCLA Resnick Program for Food Law and Policy, and features leading researchers, including the Nutrition Policy Institute’s Lorrene Ritchie and Suzanna Martinez, and UC Global Food Initiative’s Ruben Canedo, who will participate in a panel discussion on “University of California Leading the Way to Address Food Insecurity in Students,” and NPI’s Barbara Laraia, who will be part of a panel discussion on “Food Insecurity, Stress, and Nutrition.” Register. A special double issue of UC ANR’s California Agriculture magazine is now available, featuring 96 pages of research and other articles related to UC’s Global Food Initiative. The issue was guided by Nutrition Policy Institute Director Lorrene Ritchie and GFI Program Manager Gale Sheean-Remotto and includes an editorial by UC President Janet Napolitano, six stories on the the Global Food Initiative’s accomplishments and 10 research papers. NPI’s Suzanna Martinez contributed the paper ”College students identify university support for basic needs and life skills as key ingredient in food insecurity on campus.” Ritchie and Martinez previously published the groundbreaking 2016 University of California systemwide survey that showed that 42% of UC college students experienced food insecurity. The National Drinking Water Alliance holds Congressional educational briefing in Washington, D.C. The National Drinking Water Alliance held a Congressional educational briefing on September 12, 2017, in the U.S. Capitol on "Issues in Drinking Water." Senators Cory Booker (D-NJ), Bob Casey (D-PA) and Debbie Stabenow (D-MI) co-sponsored the briefing. Attendees included representatives from more than 50 organizations and congressional staffers from both sides of the aisle. The briefing featured three distinguished speakers who highlighted the importance of drinking water for health and the need for sturdy infrastructure for tap water: William H. Dietz, chair of the Redstone Global Center for Prevention and Wellness at George Washington University; Vice Admiral Manson Brown of the U.S. Coast Guard (Ret. ); and Tom Neltner of the Environmental Defense Fund. The briefing kicked off with a surprise for the crowd of well over 100 attendees: Steph Curry, of the defending NBA champions the Golden State Warriors, gave a vibrant shout-out for water and welcoming message by video. The September 2017 issue of the Nutrition Policy Institute's Research to Action highlights ways that oral health and medical professionals can partner to reduce children's consumption of a shared enemy that leads to both obesity and dental caries: sugar-sweetened beverages. The Gastropod “Lunch Gets Schooled” episode, released September 11, 2017, mentions Nutrition Policy Institute’s research collaboration with UC Berkeley economists to investigate how healthy school lunches affect students' academic success. The NPI research mentioned on the podcast was previously highlighted in an article in The Atlantic in March 2017. As part of a Berkeley Food Institute project (“Making the Business Case for Improved Farm Labor Conditions”) and in collaboration with researchers at UC Berkeley, the Nutrition Policy Institute’s Ron Strochlic conducted research on the Equitable Food Initiative (EFI), a new voluntary certification program promoting reduced pesticide use, increased food safety and improved labor conditions on farms in the U.S., Canada and Mexico. The research goals were to: 1) develop a set of indicators to lay the groundwork for future research quantifying costs and benefits associated with participation in social certification schemes, and 2) explore the “Leadership Teams” model, an innovative worker-management model promoting worker awareness of the EFI standards and improved channels of communication. The research findings indicate a range of costs and benefits associated with social certification and the Leadership Teams model, including improved food safety, improved channels of communication and improved conditions for agricultural workers. The research was funded by the Berkeley Food Institute and the David and Lucile Packard Foundation. Read more about “Making the Business Case for Improved Farm Labor Conditions” in Berkeley Food Institute’s Interdisciplinary Research Projects 2013-2017 booklet. Nutrition Policy Institute affiliated researcher Kris Madsen MD, MPH, begins a new role as faculty director of the Berkeley Food Institute as of the start of the fall semester. Madsen looks forward to "working with faculty, students and staff across campus to advance sustainable agricultural practices, to ensure fair labor practices across the food chain, and to innovate to ensure access to affordable and healthy food in all communities." The Academy of Nutrition and Dietetics’ Priorities for the 2018 Farm Bill have been released by the Academy’s Farm Bill workgroup. The workgroup was co-chaired by Nutrition Policy Institute’s Lauren Au and Creating a Hunger Free North Dakota’s Karen Ehrens. Working under the Legislative and Public Policy Committee, the Academy’s Farm Bill workgroup prioritizes four major areas of work, each of which has specific programmatic and structural recommendations for Congress to consider as they work on the 2018 Farm Bill. The four areas are: 1) Empower consumers — drive demand toward healthful foods and reduce food waste, 2) Ensure sound science and program evaluation for future evidenced-based decision making, 3) Support innovative nutrition assistance programs to improve access to healthful, affordable and safe foods, and 4) Support the food supply chain: producers and retailers that create a healthful and safe food system and reduce food waste. The United States Department of Agriculture/Agricultural Research Service (USDA/ARS) Children’s Nutrition Research Center (CNRC) at Baylor College of Medicine was awarded funding to create the USDA Center for WIC Nutrition Education Innovations (CNRC WIC Center) in August 2012. The major goal of the CNRC WIC Center was to develop and administer a competitive process to solicit, evaluate and fund innovative and effective WIC nutrition education sub-grants. A Request for Applications was developed and issued two times. University-based researchers, collaborating with state/local WIC collaborators, were eligible to respond. Four awards were made: 1) Dr. Rafael Perez-Escamilla at Yale for LATCH (Lactation Advice Thru Texting Can Help), 2) Dr. Lorrene Ritchie at University of California Nutrition Policy Institute for Online Nutrition Education: WIC in the 21st Century, 3) Dr. Jennifer Di Noia at William Paterson University for Online WIC Nutrition Education to Promote Farmer Markets Fruit and Vegetable Purchases and Consumption, and 4) Dr. M. Jane Heinig at University of California, Davis for Supporting Baby Behavior Through Pediatric Offices. These were distinct projects with different outcomes measures (breakfast dietary behaviors, salt reduction, breastfeeding maintenance for three months, timing of first postpartum contact between mother and Peer Counselor, improvements in fruit and vegetable intake and use of farmers’ market nutrition program and WIC cash value vouchers, and the effect of providing baby behavior tools and training designed for medical staff on provider knowledge and practice and on WIC participant outcomes (infant BMI z score). The USDA/ARS Center for WIC Nutrition Education Innovations has now published a workshop summary and final report on the funded studies. The Nutrition Policy Institute is evaluating a new model of distribution of fresh produce by a school district that benefits both farmers and the local community. The Food Hub, pioneered by the Riverside, California Unified School District, provides a model that can expand markets for specialty crops into areas that lack the resources and volume to make fresh produce part of their menus or sales, and that the growers previously have not been able to penetrate. Small school districts, corner stores, childcare homes and centers, small restaurants and WIC stores can all benefit from the increased access to fresh produce through the RUSD Food Hub. In addition, these outlets provide a place to sell small and cosmetically imperfect produce, thereby reducing food waste while also developing a new revenue stream for local farmers. If the RUSD Food Hub is successful, the model could be adopted by other large school districts, each of which can develop new markets for specialty crop growers while improving nutrition for needy communities. Suzanna Martinez MS, PhD, just completed a training program in Behavioral Sleep and Medicine at New York University’s Langone Medical Center, sponsored by the National Heart, Lung and Blood Institute of the National Institutes of Health. The training program, which is part of the Programs to Increase Diversity Among Individuals Engaged in Health-Related Research (PRIDE), aims to increase the number of scientists and research-oriented faculty who are from backgrounds currently under-represented in the biomedical sciences by preparing them to successfully compete for external funding for scientific research in heart, lung, blood and sleep disorders. Successful completion of this institute establishes a network of 36 trained minority faculty applying proven behavioral cardiovascular disease risk reduction models to eliminate health disparities. Lauren Au, PhD, RD, presented as part of the e-Learning and Nutrition Education for Lower-Income Audiences panel at the Society for Nutrition Education and Behavior conference in Washington D.C. The panel raised awareness and demonstrated innovative eLearning delivery nutrition education programs especially tailored to lower-income audiences, such as those eligible for WIC, EFNEP, and SNAP-Ed. Au shared NPI’s research on WIC from two papers: If You Build It They Will Come: Satisfaction and Utilization of WIC Participants with Online and Traditional In-Person Nutrition Education, and Evaluation of Online and In-Person Nutrition Education Related to Salt Knowledge and Behaviors among Special Supplemental Nutrition Program for Women, Infants, and Children Participants. ideas42 has just published a blog post discussing efforts to use behavioral science to maximize the impact of public programs, helping benefits reach more people who need them. ideas 42 and the Nutrition Policy Institute collaborated on a report, "Using Behavioral Science to Improve the WIC Experience," that was published in May. Lorrene Ritchie is a co-author of Community Policies and Programs to Prevent Obesity and Child Adiposity, also known as the Healthy Communities Study. The observational study assessed the relationships of characteristics and intensity of community policies and programs with adiposity, diet and physical activity in children, taking advantage of variation across the U.S. in community actions to prevent child obesity. The study provides plausible evidence that comprehensive community policies and programs targeting a greater number of distinct physical activity and nutrition behaviors were associated with lower child adiposity. The second issue of the Nutrition Policy Institute’s Research to Action news brief focuses on the importance of the Special Supplemental Nutrition Program for Women, Infants, and Children (known as WIC). The issue highlights the public health success of the WIC program and provides a wealth of links to key evidence-based research about the program. Future editions of Research to Action will be sent several times per year. Please sign up for the Research to Action mailing list, and please share Research to Action with colleagues who would be interested in receiving it. Lauren Au presents public policy workshop in Washington, D.C.
Lauren Au spoke to more than 350 Academy of Nutrition and Dietetics members at the Public Policy Workshop in Washington, D.C. on June 25-26 about the role of nutrition education (SNAP-Ed and EFNEP) in the Farm Bill. Au also participated in Hill visits to California Senators Kamala Harris and Dianne Feinstein and California Representative Barbara Lee to provide information on the value of nutrition in preventing illness and chronic disease. The Public Policy Workshop focuses on critical policies that impact the health of the nation and the dietetics profession. Attendees receive top notch leadership and communications training. At the end of the Public Policy Workshop, participants put their knowledge into action when they visit Capitol Hill and meet with members of Congress. National Drinking Water Alliance Director and NPI Senior Policy Analyst Christina Hecht was invited to speak on June 21-22, 2017 at the National Academies of Sciences, Engineering and Medicine about the importance of drinking water for children aged 0-5. National Drinking Water Alliance Director and NPI Senior Policy Analyst Christina Hecht was invited to speak about tap water safety on June 13, 2017 at the National Governors’ Association Center for Best Practices. The Nutrition Education and Obesity Prevention Research and Evaluation Unit of the Nutrition Policy Institute has made available its recent report prepared for the California Department of Public Health Nutrition Education and Obesity Prevention Branch. The report, titled Review of the Evidence: Health Promotion Strategies for Retail Food Shopping Venues, examined the evidence and found that, among health promotion strategies, monetary incentives for promoting healthy food purchases and improving diet are effective. The report also found that opening new supermarkets in underserved areas is ineffective because low-income households' shopping behaviors are most influenced by prices and, as a result, people shop at supermarkets, regardless of having to travel distances to do so. Evidence on other retail food shopping intervention strategies is inconclusive, the report notes. The University of California Division of Agriculture and Natural Resources/Nutrition Policy Institute are seeking outstanding students to apply for the 2017-18 Global Food Initiative Fellowship in Communications/Outreach. The UC ANR GFI Fellowship in Communications/Outreach focuses on community outreach and education, specifically: 1) educating the public through written, visual, and online communications about nutrition policy, food security, federal food programs, food waste reuse, childhood obesity prevention and other nutrition and food policy issues, and 2) educating the public through written, visual, and online communications about UC ANR’s impact on the above topics. The application deadline is Friday, June 16, 2017. For more information and application instructions, please see the UC ANR GFI Fellow in Communications flyer. The Nutrition Policy Institute's Pat Crawford and Wendi Gosliner have penned an op-ed urging changes in public policy to address the threat of caffeine in energy drinks, after the death of a teen last month from over-consumption of caffeine. The op-ed appears in the Washington Post, and states: "The teen wasn’t the first to pay a terrible price for drinking popular beverages that are commonly (but mistakenly) considered safe, but he should be the last. The government must take steps to reduce caffeine levels allowed in energy drinks; to clearly provide recommendations on safe caffeine consumption for children and adolescents; to ban the marketing of energy drinks to young people of all ages; and to help educate the public on the health risks of high caffeine intake." As the op-ed notes, the problem is serious. Between 2005 and 2011, "energy drink-related emergency-room visits rose from 1,494 to 20,783." Yet, there is currently no legal requirement to include information about caffeine content on product labels. A letter voicing support for the July 2018 compliance date for the updated Nutrition Facts label has now been signed by an additional 28 scientists, bring the total to 71 scientists and researchers, including NPI's Director Lorrene Ritchie, urging no delay in the implementation of the updated Nutrition Facts label. The Center for Science in the Public Interest has also created an infographic on Why We Need Updated Nutrition Facts by July 2018. More than 40 scientists and researchers from across the country, including Nutrition Policy Institute Director and UC Cooperative Extension Specialist Lorrene Ritchie, have called on Health and Human Services Secretary Tom Price and Food and Drug Administration Commissioner Scott Gottlieb to maintain the July 2018 compliance date for the updated Nutrition Facts label. "Americans consume added sugars, especially sugar-sweetened beverages, in amounts that are linked to a higher risk of heart disease, type 2 diabetes, obesity, tooth decay, and nutrient-poor diets," the scientists and researchers wrote to Price and Gottlieb. "The new Nutrition Facts labels would also tell consumers how much of a day’s worth of added sugars a serving of food contains." The updated label is important, they wrote, because it will better allow consumers to follow the advice of leading health authorities, including the government’s Dietary Guidelines for Americans: "Without those labels, consumers cannot follow advice from the government’s own Dietary Guidelines for Americans, American Heart Association, World Health Organization and other health authorities to cut back on added sugars." The Nutrition Policy Institute and ideas42 have collaborated on a publication that is a compilation of literature review, field observations, and interviews with WIC participants and staff in San Jose, California, that lays out the key behavioral barriers affecting families’ choices and actions throughout the "WIC lifecycle." The Special Supplemental Nutrition Program for Women, Infants, and Children (better known as WIC) serves about 8 million people in the U.S. every month and has been shown to improve the health and welfare of low-income families. Despite the program’s clear benefits, not all eligible families enroll, and many drop out of the program before their eligibility lapses. The NPI-ideas 42 report, "Using Behavioral Science to Improve the WIC Experience," provides an in-depth look at the psychological features of these barriers and offers a range of potential designs aimed at optimizing the experience of engaging with the program. The paper's authors are Dani Grodsky, Antonia Violante, and Anthony Barrows from ideas42 and Wendi Gosliner from the Nutrition Policy Institute. The Nutrition Policy Institute has launched a news brief called Research to Action. The publication will provide information on research, policy, news, announcements, events, articles and action items focused on nutrition and healthy communities. The first issue looks at the work of the National Drinking Water Alliance (NDWA). NPI is the “hub” for NDWA, which engages in and coordinates evidence-based efforts going on all over the country to improve tap water safety and access, especially for children, and to provide drinking water education and promotion. The NDWA website is a “go-to” resource for information on drinking water. Future editions of Research to Action will be sent several times per year. Please sign up for the Research to Action mailing list, and please share Research to Action with colleagues who would be interested in receiving it. A group of Nutrition Policy Institute staff attended the 11th annual meeting of Healthy Eating Research (HER) in St. Paul, Minnesota, to present on their research funded by HER. NPI was fortunate to have received three grants from HER, which has a very competitive grant process. Lorrene Ritchie PhD, RD, director of NPI, presented with California Food Policy Advocates partner Elyse Homel Vitale on child-care nutrition in California. Christina Hecht PhD, senior policy advisor, presented with UCSF partner Anisha Patel, MD, MSPH, MSHS, on a photo-evidence method to examine effective drinking water access in schools; Hecht also led a roundtable discussion on messaging about tap water safety. Lauren Au PhD, RD, presented on school wellness committees and children’s weight status. Also representing NPI were Pat Crawford, senior director of research, nutrition specialist and adjunct professor, and Ken Hecht, director of policy. Healthy Eating Research is a national program of the Robert Wood Johnson Foundation (RWJF) that supports research on environmental and policy strategies that have strong potential to promote healthy eating among children, especially among lower-income and racial and ethnic populations at highest risk for obesity. Research is supported in order to advance RWJF’s efforts to reverse the childhood obesity epidemic and help all children in the United States to grow up at a healthy weight. A new Nutrition Policy Institute study published in the International Journal of Rural and Remote Health explored differences in overweight and obesity based on gradations along the urban–rural continuum. An observational study was conducted using 2010-2011 FITNESSGRAM data from 5th, 7th and 9th grade students in public schools in 42 California counties. The findings indicate that students attending schools in suburban, especially larger suburban, areas appear to have lower prevalence of obesity than their peers at schools in other geographic areas. Further research is needed to understand the factors associated with differences in weight status between urban, suburban, town and rural areas. Presidents United to Solve Hunger (PUSH) is a consortium of universities from around the world working together to fight hunger and make food and nutrition security a priority on their campuses. At the PUSH Leaders Forum held March 23-24, 2017, Nutrition Policy Institute policy analyst Dani Lee spoke about UC Global Food Initiative (GFI) work that addresses student food insecurity, the GFI-funded food security data mining project, results of the 2016 UC GFI Student Food Access and Security Study, and systemwide efforts to continue to assess UC student food insecurity. Two additional members of GFI, Tyson Monagle of UC Irvine and Samantha Lubow of UC Berkeley, discussed the role of universities in ending food waste by promoting the GFI-funded zero-waste toolkit and sharing best practices from UC Davis, UC Berkeley, UC Irvine and other UC campuses to reduce food waste and reduce student food insecurity. The USDA’s WIC Infant and Toddler Feeding Practices Study 2 (WICITFPS-2): Infant Year Report, published in January 2017, now has a helpful infographic created by Westat that provides a summary of the report. NPI Director Lorrene Ritchie was one of the co-authors of the study, and NPI researcher Lauren Au supported background and literature searches for the study, which showed a dramatic increase over time in WIC’s influence in promoting healthy feeding practices for babies. On March 6–9, a UC ANR delegation, including Nutrition Policy Institute Director Lorrene Ritchie, attended the 35th Annual Council on Agriculture Research, Extension and Teaching (CARET) meetings in Washington D.C. CARET is part of the Association of Public and Land-grant Universities (APLU). The UC ANR delegation also visited members of Congress to explain the importance of science and research to California. On Monday, March 6, 2017, Nutrition Policy Institute researcher Lauren Au PhD, RD gives the keynote presentation at the California Academy of Nutrition and Dietetics’ 2017 Public Policy Workshop in Sacramento, California. Au’s keynote, “Building Effective Relationships with Legislators,” draws on her experience on legislative public policy committees and a Farm Bill workgroup, as well as her experience as a Congressional fellow. Key takeaways from Au’s talk will be the benefits of maintaining meaningful relationships with legislators and staff, and proven strategies for successfully communicating with legislators and staff. To address the lack of guidelines for infant and toddler feeding practices in the United States, Healthy Eating Research (HER), a national program of the Robert Wood Johnson Foundation, convened an expert panel, including Nutrition Policy Institute’s Lorrene Ritchie, to review the evidence that has emerged over the past two decades for promoting healthy nutrition and feeding patterns for infants and toddlers (ages 2 or younger). The panel’s resulting report, Best Practices for Promoting Healthy Nutrition, Feeding Patterns, and Weight Status for Infants and Toddlers from Birth to 24 Months has just been published. The evidence-based guidelines produced by the expert panel provide the most comprehensive and pragmatic approach to date for communicating to caregivers what and how best to feed infants and toddlers, while also taking into account the rapidly changing developmental stages during the first two years of life. The guidelines can be used by parents and caregivers in the home or child-care settings, and by health care providers and staff from programs such as WIC to give proper infant and toddler feeding advice to parents and caregivers. A webinar featuring panel members and Healthy Eating Research staff will be held on March 7 to discuss the guidelines; register in advance for the webinar. A new Nutrition Policy Institute study published in the Journal of the Academy of Nutrition and Dietetics concludes that, among participants in the Special Supplemental Nutrition Program for Women, Infants, and Children (known as WIC), both online and in-person education resulted in improvements in knowledge and behaviors associated with reducing salt intake. Furthermore, the study notes that offering an online education option for WIC participants could broaden the reach of nutrition education and lead to long-term positive dietary changes. The study is the third that NPI has conducted among a specific population of WIC participants. The previous studies examined breakfast-eating behaviors and satisfaction with online and traditional in-person nutrition education. Nutrition Policy Institute Director Lorrene Ritchie and Project Scientist Wendi Gosliner were quoted in a recent article on how California is reinventing school lunch. Ritchie, who, with UC Berkeley colleague Kris Madsen, is evaluating the effectiveness of a San Francisco Unified School District pilot program to make school dining more enjoyable, noted how the dining experience has improved. “It’s set up to be more friendly to students, like at a restaurant,” said Ritchie, who also noted that the nutritional quality of school meals is often better than meals brought from home. Gosliner recounted how the ongoing federal commitment to a National School Lunch Program started in 1946, primarily due to the success of school meals as a way to provide the agricultural sector a market for its surplus food. Now it’s part of a national dialogue about how the nation eats. On February 3, 2017, UC ANR’s Nutrition Policy Institute and the Public Health Alliance of Southern California co-hosted a food waste prevention/food resource optimization meeting with California’s largest nutrition education program leaders in Sacramento. Participants represented the California Department of Education, the California Department of Public Health (WIC and NEOPB (SNAP-Ed) Branches), UC CalFresh, and UCCE. Representatives from each program shared the ways in which they are currently addressing food waste prevention/resource optimization and then heard from an expert panel about the work happening statewide and nationally to prevent food waste. Speakers included Dana Gunders from NRDC, Nick Lapis from Californians Against Waste and Chris Hunt from ReFED. Speakers characterized the issue of food waste; highlighted campaigns to prevent waste, such as NRDC’s Ad Council Save the Food campaign, EPA’s Food Too Good To Waste, and USDA’s Let’s Talk Trash campaigns; and shared recent California legislation, grant opportunities and other efforts to reduce food waste. As a result of the meeting, the participating agencies identified new opportunities to address food waste prevention in their own organizations and unanimously agreed to continue meeting in order to develop shared messages related to food waste prevention/resource optimization; to consider policy, system and environmental change efforts the group could pursue in the future; and to consider additional ways to incorporate food waste prevention into food and nutrition-related program and policy efforts in California. As Nutrition Policy Institute’s Project Scientist Wendi Gosliner notes in a recent UC Food Observer blog post, up to 40 percent of food produced in the United States is wasted. How can we tackle this critical issue? On February 3, 2017, Gosliner and other leaders from California’s public health and nutrition education programs (including WIC, the National School Lunch Program, SNAP-Ed and UC Cooperative Extension) will meet in Sacramento to brainstorm new strategies to help Californians reduce food waste through consumer messaging as well as proposed policy and system changes. Many states are exploring ways to reduce food waste, but California is emerging as a leader. Reducing food waste presents a win-win opportunity in California, where innovative state mandates are in place to address climate change. Nutrition Policy Institute’s Senior Policy Advisor Christina Hecht contributed a piece describing the National Drinking Water Alliance (NDWA) to the UC Food Observer’s guest blog. NDWA is a national coalition of nonprofits, academic institutions, advocates and individuals, and works to ensure that all children are able to readily access safe drinking water in the places where they live, learn and play. NDWA’s website serves as a “clearinghouse” for information about drinking water. It contains literally hundreds of useful tools, research studies, fact sheets, promotional materials, policy papers and the latest news from the field. The U.S. Department of Agriculture’s (USDA) Special Supplemental Nutrition Program for Women, Infants, and Children (WIC) was established to safeguard the health of low-income pregnant women and infants who are at nutritional risk. The WIC Infant and Toddler Feeding Practices Study–2 (WIC ITFPS-2) “Feeding My Baby” captures data on WIC caregivers and their children over the first five years of each child’s life to address a series of research questions regarding feeding practices, the effect of WIC services on those practices, and the health and nutrition outcomes of children on WIC. This new study assesses changes in behaviors and trends that may have occurred over the past 20 years by comparing the findings to the first WIC Infant Feeding Practices Study–1 (WIC IFPS-1), the last major study of the diets of infants on WIC. Just released, the new study found that, due to WIC, mothers made positive changes in how they feed themselves and their families, knowing how to choose more healthy foods, breastfeeding at a higher rate and eating more fruits and vegetables. NPI Director Lorrene Ritchie is one of the co-authors of the new study, and NPI researcher Lauren Au supported background and literature searches for the study. In an informative presentation from the 2016 Center for Obesity Assessment, Study and Treatment (COAST) Sugar, Stress, Environment and Weight (SSEW) Initiative Symposium, Dr. Lorrene Ritchie and Dr. Pat Crawford discuss the scientific methods the Nutrition Policy Institute (NPI) uses to help turn research into policy. “Good science is needed to inform good nutrition policy,” states Ritchie during the presentation, and she and Crawford provide examples of research-influenced nutrition policies that have helped reduce the epidemic of childhood obesity. By combining quantitative research with qualitative research, and by engaging stakeholders and partners in collaborating on solutions, NPI helped bring groundbreaking nutrition policies such as the Pupil Nutrition, Health and Achievement Act of 2001 and the Healthy Beverages in Child Care Act (effective January 1, 2012) to fruition. A recent blog post highlights First Lady Michelle Obama's important work with the Let's Move! initiative to help raise a healthier generation of kids and families. Mrs. Obama's leadership in raising public awareness of the epidemic of childhood obesity and implementing strategies that prevent obesity and improve health has had a powerful impact. In a Huffington Post article by Joseph Erbentraut on efforts by conservative lawmakers in the House Freedom Caucus to do away with the school lunch program, Dr. Lorrene Ritchie, director of the Nutrition Policy Institute, was quoted about the benefits of the program. "If we want to improve child nutrition, there is no better way I know of that will impact so many children," she said about the school lunch program. "Repealing this seems to me to make no sense." The article went on to mention a study Ritchie helped author that was published in the November 2016 issue of the Journal of the Academy of Nutrition and Dietetics. The study found that meals served in the school lunch program were of a higher nutritional quality than meals brought from home. One out of every 7 households in the US is food insecure. Over half of our infants receive some type of federal food support (WIC). Beyond "farm to table," what happens when a nation's students are unable to get the nutrition they need? On the Farm To Table Talk podcast, Dr. Lorrene Ritchie, director of the Nutrition Policy Institute, sizes up the issue, explains the research findings and suggests a way forward where everyone can help. Lunches served in the National School Lunch Program have higher nutritional quality than lunches brought from home, according to the largest comparison study conducted to date. Published in the November 2016 issue of the Journal of the Academy of Nutrition and Dietetics, the study, conducted by researchers at UC's Nutrition Policy Institute, involved nearly 4,000 elementary school students in Southern California. In a video profile created by the Academy of Nutrition and Dietetics Foundation, NPI researcher Lauren Au observes the long-lasting impacts of using research to inform nutrition policies. Au notes that by encouraging access to healthy foods and healthy drinking options, and by promoting changes in behavior to improve health and well-being, nutrition policy initiatives can help reduce food insecurity, obesity, and diabetes in the U.S. and also serve as a model for other countries around the world. The National Drinking Water Alliance recently launched its new online resource, a clearinghouse for drinking water research, policy, access and education. The website contains hundreds of useful tools, research studies, fact sheets, promotional materials and policy papers, as well as the latest developments in the field. The National Drinking Water Alliance is a coalition of nonprofits, academic institutions, advocates and individuals that works to ensure that all children are able to access safe drinking water in the places where they live, learn and play. Registration is now open for the 8th annual Sugar, Stress, Environment and Weight (SSEW) Symposium "Food & Addiction: Environment, Policy, and Individual Factors” on Thursday, October 27, 2016 from 10 am to 4 pm at UCSF Laurel Heights, S124 Auditorium. Join NPI’s Pat Crawford and Lorrene Ritchie for the exciting opportunity hear leading researchers, health professionals and influential policy makers from the UC system and beyond explore the intersections of biology, behavior, food and addiction, and discuss how to prevent food addiction across the lifespan for individuals and communities. Register. Two researchers at the Nutrition Policy Institute have been awarded K01 Career Development Awards by the National Institutes of Health (NIH), National Heart, Lung, and Blood Institute. Lauren Au will research disparities in the relationship between the school nutrition environment and childhood obesity and Suzanna Martinez will study sleep duration and risk for obesity in Mexican American children. NPI’s Director, Lorrene Ritchie, was named to the Nutrition and Healthy Food Choices Advisory Council of the Foundation for Food and Agriculture Research (FFAR). Each Advisory Council of the Foundation is composed of leading experts across the food and agriculture industry. The Foundation’s focus is on increasing the scientific and technological research, innovation and partnerships critical to enhancing sustainable production of nutritious food for a growing global population. See press release here. As part of the University of California Global Food Initiative, there was interest in understanding student perspectives on food insecurity. NPI and the Food Access and Security Committee, led by Ruben Canedo and Tim Galarneu, collaborated with UC students Sanna Alas, Tyler Watson and Ali Shahbaz, to create a video that puts a face on food insecurity and helps to raise awareness of the issue on UC campuses. NPI, in collaboration with the UC Davis World Food Center and the UC Global Food Initiative, is hosting the World Food Day Video Challenge. Undergraduate and graduate students across all UC campuses are invited to submit short videos highlighting UC research addressing hunger, health and a more sustainable food system. The deadline for submissions is September 7, 2016. Please see http://worldfoodcenter.ucdavis.edu/video-challenge/ for more information. Dr. Lauren Au, a NPI researcher was proclaimed a nutrition hero in the Food & Nutrition Magazine, published by the Academy of Nutrition and Dietetics, the world's largest organization of food and nutrition professionals. Read her profile here. NPI applauds Smart Snacks for school children. For more information visit UC Division of Agriculture and Natural Resources Food Blog. Dr. Suzanna Martinez was interviewed today by Pat Brooks on the Up Front Program on KPFA Berkeley’s radio station about a recent UC report about food insecurity among UC Students. Based on over 9,000 students surveys, the study found that 42% of UC students had some degree of food insecurity. NPI recently conducted a survey of food insecurity among University of California students at all 10 campuses as part of President Napolitano’s Global Food Initiative. We found that 42% of students reported being food insecure in the past 12 months--meaning they experienced a diet poor in quality and/or reduced dietary intake, such as skipping meals or cutting the size of their meals due to lack of financial resources. The full report, Student Food Access and Security Study, includes the University of California systemwide results and plans for addressing the issue. Implications of New Added Sugars Content on Nutrition Labels in the U.S.
NPI’s Pat Crawford comments on implications with other UC researchers on the new Nutrition Facts label for packaged foods in the U.S. For the first time, added sugars will appear on the label starting in 2018. NPI researchers Liz Campbell, Laura Vollmer and Karen Webb will host a free webinar, "Fostering Partnerships: Supporting Healthful Foods in the Charitable Food Network" on Monday, June 23, 2016 from 10:00 to 11:30 am Pacific time. They will discuss nutrition guidelines and policies for food banks, and how Cooperative Extension, public health departments and others can work collaboratively with food pantries and food banks to support improvements in healthful food procurement and distribution. *Please note: This event has been moved from Monday, June 13, 2016 to Thursday, June 23, 2016. A new report from The Pew Charitable Trust includes results from 6 case studies conducted by NPI about the benefits of USDA kitchen-equipment grants to improve the school meal operations and nutrition quality of school meals. The case studies examine the benefits to school meal quality from small improvements to the school kitchen space. Thirteen more case studies will be released later this summer. NPI researchers found that online delivery of education is an acceptable addition to traditional in-person education for WIC participants with online access. High-quality online education platforms represent an important avenue to promote continued satisfaction with nutrition education. Lorrene Ritchie, PhD, RD, NPI's Director and CE Specialist at the University of California's Division of Agriculture and Natural Resources, commends the U.S. Department of Agriculture in a support letter upon the release of the Final Rule containing new nutrition standards for the Child and Adult Care Food Program (CACFP). NPI, in collaboration with the UC Berkeley School of Social Welfare, the UC Berkeley Law School, the UC Berkeley Department of Sociology, the University of San Francisco and the California Association of Food Banks, was awarded one of two 2016 Berkeley Food Institute seed grants. The research will explore intra-household gender dynamics among immigrant Latino households in California as a barrier to CalFresh enrollment. Anecdotal data suggests that male head of household opposition to CalFresh enrollment has contributed to lower uptake rates. The research will explore the nature and extent of this issue and develop program, outreach and policy recommendations. Researchers at NPI developed nutrition standards for family child care settings. The nutrition standards are based on evidence, feasibility and input from practice-based advisors so they are realistic and impactful on health. Researchers at UC ANR’s Nutrition Policy Institute participated in a study that assessed the impact of 2009 changes in the WIC food package for young children.They found that children in WIC households were 5 times more likely than other comparable children to have eaten vegetables in a two-day period. Eating other healthful foods also increased among the WIC children, although not as dramatically as green vegetable and bean consumption. This study shows that modifying the WIC food package was an important and effective policy change, improving children’s diets and, potentially, their future health. NPI Director Ritchie spoke at the 2016 Push Leaders Forum on February 25 at the University of Missouri-Columbia. This is part of Presidents United to Solve Hunger, which is dedicated to harnessing the power of universities and their leadership to address hunger issues. Dr. Ritchie, NPI Director, commented about the sugar and beverage guidance in the new U.S. Dietary Guidelines for Americans with other UC experts in universityofcalifornia.edu News. The Nutrition Policy Institute, in collaboration with Karina Diaz Rios, Katherine Soule and Marisa Neelon in the UC Cooperative Extension and Dr. Abbey Alkon at UC San Francisco, was recently awarded a 3-year grant from UC’s Division of Agriculture and Natural Resources to support an innovative training to prevent obesity among preschoolers. One in every four youngsters is obese or overweight before entering kindergarten. This project will develop, pilot test, evaluate and disseminate an online training for licensed child care providers on how to create and maintain a healthy beverage environment for young children in child care. To celebrate National Food Day and help others for the holidays, NPI organized a food drive among University of California Office of the President employees in Oakland. They donated a total of $3,808 and 283 cans and packages of food to the Alameda County Community Food Bank. Both in-person and online education are effective in reducing breakfast-skipping and improving nutrition in children, according to a new study Online and In-Person Nutrition EducationImproves Breakfast Knowledge, Attitudes, and Behaviors: A Randomized Trial of Participants in the Special Supplemental Nutrition Program for Women, Infants, and Children in the Journal of the Academy of Nutrition and Dietetics. A unique benefit of the Special Supplemental Nutrition Program for Women, Infants, and Children (WIC) is the inclusion of nutrition education. NPI researchers report that both online and in-person group education are effective in helping parents reduce breakfast-skipping and improve other breakfast-related nutritional knowledge and benefits. You can watch a short podcast about the study and for more information about the results, visit the article at the UC Agriculture and Natural Resources blog site. Affiliated NPI researchers Hannah Thompson and Kris Madsen recently published an article on physical education (PE) in schools, Lessons Learned: A Strategic Alliance to Improve Elementary Physical Education in an Urban School District in Progress in Community Health Partnerships. They detail the actions, impact and successes of a strategic alliance formed by three collaborating organizations to improve PE in San Francisco public elementary schools. NPI was awarded a new grant from the Robert Wood Johnson Foundation’s Healthy Eating Research Program to evaluate the impact of the new USDA Child and Adult Care Food Program (CACFP) nutrition standards.CACFP provides nutritious foods to over 3 million young children in family or group day care homes in the US. The nutrition standards have not changed since CACFP’s inception in 1968. This is about to change: the USDA recently proposed new nutrition standards which will have the largest impact on the daily nutrition of young children of any single nutrition policy since CACFP’s introduction. This new NPI study will track the implementation successes and challenges of the transition to enhance their effectiveness. NPI research is helping provide healthier beverage choices for California preschoolers in child care. Lorrene Ritchie conducted a study that found a substantial need for improving the beverages served to young children in licensed child care. This research finding helped lead to the Healthy Beverages in Child Care Law (AB 2084), aimed at offering alternatives to sugary drinks. This law currently stands among the most comprehensive of any state laws on child care beverages. NPI researchers’ new article School Breakfast Policy is Associated with Dietary Intake of Fourth- and Fifth-Grade Students in the Journal of the Academy of Nutrition and Dietetics showed that breakfast in the classroom policies increased dietary quality without increasing overall caloric intake throughout the day. NPI took part in the first national evaluation of the USDA’s Fresh Fruit and Vegetable Program. The program, which provides healthy fruit and vegetable snacks at elementary schools, was successful in increasing the intake of elementary students by 1/3 of a cup per day. More information on the study results can be found in the Journal of the Academy of Nutrition and Dietetics. California has regulations on the beverages that can be served in child care centers and homes that are more comprehensive than any other state. Recent findings from an NPI study published in Preventing Chronic Disease describes the impact of the state of the drinking water provision on young children. The NIH-funded Healthy Communities Study methods articles have been released in the American Journal of Preventive Medicine. NPI developed and monitored the nutrition study protocol for children and the food environment. This national five-year study aims to answer the question: What community strategies are working to improve child nutrition and reduce child obesity? NPI and UC Berkeley are partnering with SF Unified School District on a new USDA-funded study to test the impact of innovative school lunches. There is a story by Mark Bittman about these school dining reforms in the New York Times. On Thursday, September 3, 2015, Congressman Mark DeSaulnier (CA-11, Concord) paid a visit to Mt. Diablo Unified School District (MDUSD) in Concord, CA to showcase the district’s new kitchen equipment, purchased with funds from USDA kitchen-upgrade grants. NPI has a contract with The Pew Charitable Trusts to conduct case studies across California and five other states to highlight the benefits of these grants for schools that need the new food service equipment to produce healthy meals for students from scratch. MDUSD serves over 2.5 million lunches every school year, and school meals can provide more than half a child's nutrition in a day. For more information see this ANR blog post. The New York Times published a column about dehydration in “Upshot” (August 24) written by Dr. Aaron Carroll. Print and online editions of the August 31 Times published a letter to the editor co-signed by Christina Hecht, Nutrition Policy Institute, and Patrice Pascual, Children’s Dental Health Project, citing Dr. Carroll's column and underscoring the importance of encouraging children and adults to consume tap water, particularly as a replacement for sugary beverages. Read the letter here. Results released this morning from a new national survey commissioned by the W.K. Kellogg Foundation show 9 out of 10 people in the U.S. support the national school nutrition standards and 91% say kids need access to safe drinking water in schools. For full survey results on national opinion on School Meals, the Dietary Guidelines for Americans, and a toolkit with resources, go to http://bit.ly/1Ksk0zo. NPI is featured in a new Global Food Initiative publication highlighting ways that UC research has been used to inform and affect policies in food, nutrition and agriculture. UC President Janet Napolitano says "promoting calorie-free water is an essential strategy in fighting the nation’s obesity and diabetes epidemics." In a letter to the secretaries of the USDA and HHS, Napolitano urged the government to add a symbol for water on the USDA MyPlate infographic. It's not too late to join the effort to promote plain drinking water as the beverage of choice for Americans. But time is running out. Click here to tell Washington to Make Water First for Thirst. NEW! Resources from NPI to help food banks and those who work with them to improve the nutrition quality of the foods they distribute. Click here to watch our new video, register for a free online course and read our discussion paper published by the Institute of Medicine on the opportunities and challenges for improving the nutrition quality of charitable foods. Nutrition Policy Institute urges USDA to make water "First for Thirst"
The Nutrition Policy Institute welcomes Pat Crawford from the Atkins Center for Weight and Health at UC Berkeley. Over the past 15 years, Pat has directed this stellar and growing research center. Pat’s research team and projects also will join NPI. Read the announcement letters by Lorrene Ritchie and Pat Crawford. Tell Washington to make water "First for Thirst"
The comment period is now open for the very important 2015 Dietary Guidelines for Americans. The DGAs provide advice to every American on what makes up a healthy diet, and drinking water deserves to be part of that advice. The DGAs also control nutrition standards for WIC, School Lunch, School Breakfast, and the Child and Adult Care Food Program – and the Guidelines will be turned into the MyPlate graphic that nearly every school and child care center and home has up on the wall. This is the time to make your voice heard. USDA and HHS are eager to hear from you. They need your comments – and they are easy to send (click here). USDA has rolled out the proposed nutrition standards for meals and snacks in childcare homes and centers. These are the first new standards since the program began, and they make extremely important changes. USDA wants to know what you think about these proposed new standards. Get your comments in – here’s how (click here).